Praca: can a horror shelter be turned around? If you have been reading this blog you will know about the horror shelters of Bosnia. Places that are little better – often worse – than concentration camps for dogs. These shelters are supposed to be publicly funded, and compliant with the animal welfare laws of the country – laws which are, in fact, very good. But the laws are not implemented, and the money pocketed by shelter owners or local authorities. In most shelters the dogs are barely fed, not sterilised, and not given any veterinary treatment. In 2013 we published shocking photographs taken secretly in Praca shelter, Sarajevo, a shelter that was opened in 2011. Since then – all we’ve heard are more horror stories. It is usually very hard, dangerous even, for rescuers to help dogs in public shelters – it’s not in the interests of the owners to have anyone see what is going on or to try and help the dogs. But, in January of this year there was a meeting between rescuers in Sarajevo, to see if there could be a group effort regarding Praca shelter. Sadly, only a very small group of rescuers continued after this initial meeting, but much has been done to help these dogs since then, thanks to the dedication and hard work of this small group of rescuers. They do need your help to continue. Please see the end of the post for how you can help. A written agreement was made between the NGO SAN (Save the Animals Now – http://savetheanimals.ba/ ) founded 6 years ago, and Praca’s owner. The agreement was that the rescuers would help obtain food donations to feed the dogs, would try to re-home the dogs and provide any urgent veterinary help for those who are in dire need. The agreement was made to last until April 18th of this year. What the rescuers – the Praca Management Group – encountered in Praca is almost impossible to describe. Dogs living amongst faeces that hadn’t been cleaned since the shelter opened; dogs living for months – or more – cramped in too small kennels, dogs killing each other just to eat one morsel of food. dogs terrified of light of a human voice. dogs whose physical anatomy had become deformed due to being caged for so long, dogs who had never seen real dog food, dogs who had never been petted, never heard a warm normal human voice, never known anything except shouting, beatings and hunger. “There is a dog there whose beauty leaves you speechless. I spotted her once and the next time I went to Praca I couldn’t find her in the kennels nor anywhere …. I spent weeks and weeks trying to find her. I figured they must have moved her or some dogs from that same kennel and she either escaped into the mine fields which surround the shelter, or something “else” happened … Last week, while I was feeding & cleaning the dogs’ kennels, I went again into every single one and even into those which seem deserted. I shouted and called out for her. The shelter is poorly constructed. Electricity is only available in the room where the “workers” are. Water freezes in winter. And since this is a mountain area, the temperature drops even in March and for water the rescuers have to go to the nearby stream or a further away public fountain / well. Dogs don’t get food on daily basis from the workers, and the food is either a stone hard piece of bread with fungus all over it or raw chicken legs. Many of the dogs can’t even eat this food due to their age and the fact that they bite the fence so their teeth are damaged – cracked, worn out from trying to escape their destiny to be confined to this prison. Since the rescuers have been going regularly to feed the dogs under the new contract with the shelter owner, the dogs are very much calmer, and seem to know exactly what to expect when they hear the girls arrive and they do not fight over the kibble. If they do fight, it is when the girls are not there and the shelter “workers” toss bones into the cages. Apart from hunger and the need of quality de-worming pills, anti-tick medication, the dogs also desperately need grooming. The vast majority of them are long-coated mixes, they have never been brushed, so the matted coats actually stop them from move normally – walking, lying down, eating – all are difficult with the extent of the mats in their coat. The rescuers managed to fix as much as the could with a pair of scissors. This wasn’t done for aesthetic reasons, but purely health reasons. Many dogs had plant seeds growing from their matted coats. inflamed skin, faeces embedded into their coats. Mia tells us: “There is even a female, spayed in the Dog’s Trust program but who is having puppies. We tried to address this to Dogs Trust but they did nothing to sort this out. I will try again to address this this week, because we have photos, videos, number of the ear tag and so on. The vet who is responsible for this found out that we will file a complaint about this, and he called the workers to beg us to “not do it”. Rumours say that the government wants to buy Praca once and for all – which would mean doors closed for anyone let alone rescuers. It would make it a kill shelter. Our main concern is getting all the adoptable dogs out. Our need is to find shelters abroad, charities that deal with specific breeds, private foster homes, any relocating solution , so that these adoptable, issue-free dogs can get out once and for all. I know that it can be done. I know because I’m seeing how funds are raised for such causes, and I know that it should be done. Please go to the official YouTube channel of the Praca Management Group to see more videos from the shelter. The rescuers involved with the Praca Managemnet Group are doing everything they can for these dogs. The cages and houses for all 300 dogs get cleaned properly at least once a week and nowadays also on some weekdays. That means the girls can distract the more anxious dogs with a few handfuls of food on the floor while they unlock the doors and go inside with food bowls or pieces of old food sacks to put their meals on. Otherwise they would get knocked over and the bowls sent flying each time they opened a door. With the arrival of two new electric clippers, the girls are now starting to remove the worst of the mats and knots on the coats of the long-haired dogs. There are many plans for the future – including finishing the building of the new roof – quite a few sheds are dry already. Clearly so much is needed to be done for these dogs. While some people have suggested the owners of the shelter and local government authorities be approached to make changes, this has been tried in the past to no avail, and sometimes, to the detriment of the dogs. Currently, only way for the rescuers to continue is to try to work with the situation as it is. Food, vet treatment, shelter renovations, homes are needed. The list is endless, and funds are desperately needed. Can you help? There is a YouCaring raising funds for a new roof. This is a critical need, rain is pouring into the kennels. A new murder of a stray dog has happened in Bosnia and once again all people who love and fight for the rights of animals are facing an extremely brutal and worrying case. This killing happened in city of Zenica, on the 27th April 2016. A local stray dog was shot from a building near the football stadium Bilino Polje, by an unknown shooter using a rifle. A number of people – including children – witnessed this crime. They called volunteers of the well organised and professional animal welfare organisation SAPA Zenica, but unfortunately the injured dog died 40 minutes later due to internal injuries, in particular injuries to the lungs. “His heart was slowly beating, there was no blood around the shot wound, but inside, the dog was choking as his lungs were filling with blood, and as he was looking at us while trying to take his last breath. He was not alone. Is it a comfort, I do not know, as there can be no comfort for an innocent God’s creature dying, being shot to death, killed by a monster. We will not let go, there must be a sentencing according to the Criminal Code of the Federation and the killer must be sentenced. Today a dog, tomorrow someone of us. Volunteers and management of SAPA organisation have filed a criminal report against the killer, whose identity is unknown, and they have informed the Bosnian media about this case. And….another brutal attack on a stray dog occurred in Zenica this week…. Dzeki is a famous stray dog in Zenica, much loved and known to SAPA as their beloved ‘mascot’ of Zenica. Dzeki was brutally attacked and injured with a knife by an unknown person. This attacker caused a deep injury requiring immediate medical attention. Volunteers of SAPA Zenica took her to Sarajevo where veterinarians were shocked by the extent of her injuries. Dzeki is recovering at the moment, but her condition isn’t stable yet. X-Rays showed that there is no internal bleeding, but she is very weak. Her initial surgery lasted two and a half hours. It is believed that a single offender committed these two criminal offences: torturing and killing animals which is a criminal offence in Bosnia and Herzegovina, as well as the criminal offence of provoking general danger to the public. There are specific and particular dangerous aspects of these cases. Medo, the dog who died was shot in the middle of day from a building while the surrounding park was full of people and playing children. 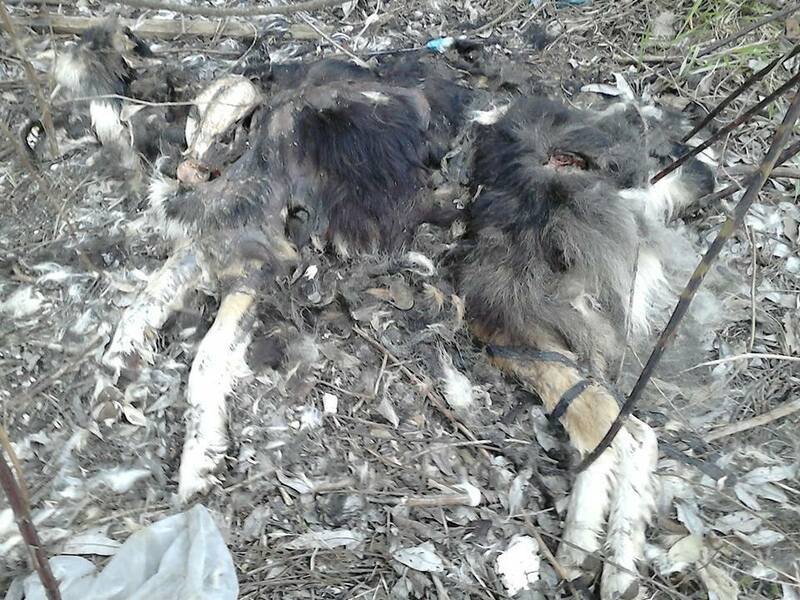 The part of Zenica where this poor dog was killed is almost in the centre of the city. In addition, the killer clearly intended to kill an innocent dog in the middle of day. The attack on Dzeki also occurred in the centre of Zenica. Using a knife without any fear in the centre of the third biggest Bosnian city proves that animal welfare activists in Zenica are dealing with a very dangerous psychopath. Since dozens of helpless dogs are exposed to this psychopath who intentionally knows what he is doing and who is fully aware of his actions and the consequences, all activists and rescuers demand that the Prosecutor’s office and the Police of Zenica – Doboj Canton investigate this case and finds the identity of a killer and brings him to justice. Currently costs for helping Dzeki include transport are 30€, X-Ray 25 € , Blood tests 30€, a total of 85€. If she does not need another surgery they have to pay daly therapy and pension at the vet of 10€ per day. We don’t have full costs of the surgery but will update here. If you want to help Dzeki, SAPA Paypal is sapazenica09@yahoo.com and please mark that it is for Dzeki.